After an extended holiday weekend kickoff, the first full weekend of college football is officially in the books. Should we crown Alabama now, or are we going to play these next few months as currently scheduled and see what happens? Welcome back to another year of McGuire’s Musings, a weekly roundup of some thoughts and reactions to what went down around the world of college football over the weekend. Let’s dig in. Who needed a win the most; Texas, Michigan, or Miami? All three ranked programs opened their season away on the road with some high expectations for the upcoming season and started the year with a loss. Texas lost on the road against Maryland, dropping a game against the Terps in the season opener for a second straight year. Michigan played under the lights in South Bend and dug an early hole against Notre Dame before an attempt to rally fell shot. And Miami was steamrolled by LSU in Arlington, marking a fourth-straight loss for the Hurricanes dating back to the end of last season when playoff hopes were dashed. I am of the mindset that all three programs will be just fine this season, but I understand the rationale behind many of the critics aiming comments at all three of these programs. The truth is, while the 2018 seasons may end up proving to be steps forward for each program, nothing feels like a setback like opening the year with a loss after a summer of hype and anticipation. Michigan’s new-and-improved offense with Ole Miss transfer quarterback Shea Patterson looked rather familiar against the Irish, and that’s not a good thing. As I noted on The Comeback after the game, there may be some bright spots to build on and the next few weeks should allow for the Wolverines to get in a comfort zone on offense before venturing into Big Ten play. Jim Harbaugh may have another tough loss on his hands, but I see no reason to suspect Michigan won’t be a factor in the Big Ten picture just yet. Texas returned home from Landover, Maryland with a tough loss that raises some concerns about the coaching, which makes sense. After all, losing to Maryland two years in a row will do that to a coach and a program. The Longhorns still had some things they can build on against the Terrapins. They did battle back after digging a sizable hole in the first half, and maybe if there isn’t a weather delay to interfere with the game the outcome might have been different. But, of course, Maryland had to deal with the weather delay too, so that’s a lousy excuse. Cutting down on self-inflicted mistakes should be manageable for Texas. As for Miami, the holes from last year showed their ugly side in the opener. If any program is likely to make some roster changes of note first in this group, it might be the Hurricanes. But as I noted on The Comeback after Miami’s rough loss to the Tigers, it may not matter who is playing quarterback for Miami if they don’t fix the offensive line. And after watching what Virginia Tech did Monday night in Tallahassee, Miami really needs to plug that line up before they meet the Hokies toward the end of the season when the division could still be on the line. Of these three programs, none of them needed to win in Week 1, but Jim Harbaugh and Michigan likely would have benefited the most with a win to silence some of the critics. But with another loss on the road against a ranked opponent, the criticisms have only grown a bit louder. Heading into the season, I just knew Nick Saban was going to let his quarterback situation play itself out on the field and he was going to be a crab apple about anyone questioning him about it for as long as he needed. Fortunately, it seems, we are turning the page on that whole situation after Saban announced Alabama will move forward with Tua Tagovailoa as the starting quarterback. Jalen Hurts will be the backup and Saban claims to want to get him involved in some ways. How that will happens remains to be seen. If you’re a casual college football fan not living in the south, you may have missed the fact that the defending ACC champions have been going through a bit of a similar situation at quarterback. Kelly Bryant is the experienced option after starting for the Tigers last season. Trevor Lawrence is the hotshot freshman who just made his college debut in splitting time with Bryant in the home opener. Unlike Saban, Dabo Swinney is going to let his quarterback battle linger into Week 2 on the road against Texas A&M this week. As most coaches do, there could be some gamesmanship in play here, as the Aggies are now coached by former Florida State head coach Jimbo Fisher. I suspect we’ll get a good sense for which direction Swinney is going to go with this as the game in College Station plays out. And while he may not admit it, Swinney may be okay with a close game to put his quarterbacks under pressure to see how they handle it on the road. Did Washington blow their shot at the playoff already? I tend to think Washington won’t make the College Football Playoff, but it’s not just because they lost to Auburn in Atlanta. If anything, I don’t think the close loss to Auburn will hurt them as much as I anticipated a loss would for the Huskies. I went into the season thinking Washington would lose at least once in Pac-12 play, as would every team in the conference to basically knock itself out of the playoff race once again. I did think Washington really needed to win their first game against the SEC’s Auburn, but I have learned my lesson with the College Football Playoff, and that is to never eliminate a team from the race this early in the season. I didn’t do it for Ohio State a few years ago and I’m most certainly not doing it for Washington now. The Huskies are still too good to lose a ton of games, and they’re good enough to win all of their remaining games. If Washington is standing at the end of the season with a record of 12-1 and the Pac-12 crown sitting on Chris Petersen’s head, then the Huskies very likely will be one of the four teams playing for all the marbles in January. I just don’t think they will win all of their remaining games. So Washington may not be eliminated, but two costly turnovers may have blown Washington’s best shot to make a playoff case down the line. I know, you’re stunned. Right? I’m not so sure what else needs to be said about this. Wisconsin did their thing with running the football and defense against an overmatched opponent on Friday night, and Ohio State let loose after weeks of scrutiny and their head coach suspended. Poor Oregon State was in the toughest spot of any team out there this weekend with having to face Ohio State in Columbus. Both teams looked ready to do their thing this weekend. The same may not be said about a few others in the Big Ten. We already touched on Michigan, but have yet to touch on what went down in Happy Valley. On the 11th anniversary of Appalachian State’s historic upset of Michigan in the Big House, the Mountaineers had Penn State on the ropes in Beaver Stadium but failed to pin the Nittany Lions and Trace McSorley down. You know the old idea that some teams score too soon? Appalachian State probably did that against the Nittany Lions. Had Jalin Moore just gone down after moving the sticks, Penn State would’ve been forced to burn their final timeouts to preserve whatever precious seconds they possibly could. But it’s also difficult to tell a player to go down when he has a chance to get in the end zone. Penn State’s offense also looked like it was out of gas before a great special teams return by KJ Hamler gave McSorley a short field to deliver a clutch touchdown. Penn State then avoided the upset bid by picking off a pass in overtime after scoring on their first possession of the extra session. Penn State scored a touchdown on the opening drive of the game, only after a taunting penalty by a freshman gave the Nittany Lions a free first down after a big third-down stop. The Nittany Lions offense then went missing until the second half. The defense looked fine until the fourth quarter when Appalachian State scored four times to take the lead in the final two minutes. So Penn State has some work to do. They head to western Pennsylvania for a primetime showdown with Pitt on Saturday night. Michigan State may have fun in the film room this week too after having to fight their way to a victory at home against Utah State. Throw in Michigan losing, and it was a pretty good weekend to be an Ohio State fan, I suppose. Maryland freshman wide receiver Jeshaun Jones became the first FBS freshman to score a touchdown with a pass, rush, and a catch in the same game since Marcus Mariota in 2012. Of course, while the feat is still impressive, I have to give the nod to Jones for topping Mariota since Mariota was a mobile quarterback. If Florida State doesn't come back, the last time both Miami and Florida State opened 0-1 was 1975. First time in my lifetime Miami, Florida State, Texas, and Michigan will all start the year 0-1. Mount Union has now won an NCAA-best 32 consecutive season openers. Why wasn’t this play reviewed? I tuned in late, so I’m not sure if I missed a reason why this play from the Florida State-Virginia Tech game was not reviewed. The Seminoles appeared to have a touchdown not credited to them. At that point in the game, who knows if that would have changed the outcome as the game was still in doubt at this point. The ACC is going to have to answer for that lack of instant replay there. And that brings me to one of my favorite pet peeves in college football; why do we have instant replay if we’re not even going to use it correctly? To me, Florida State was robbed of a touchdown that would have made it a 10-7 game. Who knows what could have happened after that? 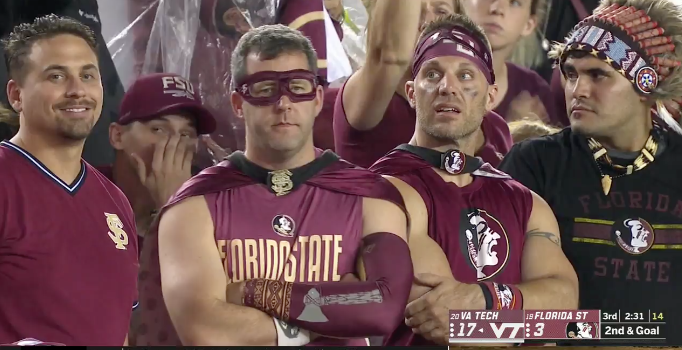 Maybe Florida State still loses in a big way, or maybe it’s a closer game the rest of the way. Michigan is never going to win with Jim Harbaugh. Virginia Tech wants Bama (or Clemson)! Willie Taggart was the wrong hire for Florida State. Chip Kelly never should’ve returned to college football. I always love watching the Group of Five race for the one spot in the big money bowl lineup. It really is one of the more fun aspects of the current format and it gives college football fans more incentive to pay attention to what’s going on outside of the power conferences. The top two candidates for this season’s spot are pretty much expected with UCF and Boise State, and neither did anything to diminish that expectation with Week 1 blowouts on the road. Memphis and Toledo also had an easy going in the season opener. However, based on all evidence seen so far, the early nod goes to Hawaii thanks to getting an early jump on the pack in Week 0. The Warriors have been riding the passing of Cole McDonald in high-scoring wins against Colorado State on the road in a Mountain West Conference game, and at home against the AAC’s Navy. With two wins against teams from the top two G5 conferences, I can’t think of any team more deserving of the top spot in my Group of Five ranking in my first ranking of the year. Yes, the defense is a setback for Hawaii, but two wins against the MWC and AAC counts for something to me right now. As a reminder, the highest-ranked Group of Five champion will be eligible for a guaranteed spot in the New Year’s Six bowl lineup, and only conference champions will be eligible for the guaranteed spot. Also, independent programs (Army, BYU, Liberty, New Mexico State, UMass) aren’t eligible for consideration. For now, every conference is in play, but some teams and conferences will likely fade as the season goes on. I continue to stand by the idea that predicting who should be in the College Football Playoff at any point during the season is a ridiculous exercise. That said, I also understand that it’s one I’ll regularly be asked about when I do a radio interview, so I do play along with the conversation. As I did last year, I’ll offer two different sets of top four teams. The first will be my current top four picks based on all games up to that point in the season and combined with some of my own selection committee logic that won’t necessarily be how the committee operates. Auburn had the best win of the weekend. Alabama and Oklahoma showed me no reason to doubt them as playoff contenders. Notre Dame sneaks in on the strength of their win against Michigan. Ohio State is just on the outside for now, and Georgia and Clemson get no credit from me for beating up on their FCS opponents in Week 1. They’ll get their chances to make their statements this weekend though. My second set of top four will be my updated playoff projection, which will take into account everything that’s happened to that point of the season and looking forward to see how I believe the rest of the season could play out. After one week, I’m not ready to shake up my preseason playoff prediction just yet, but my confidence in including Penn State was rattled slightly this weekend. Toledo had the special teams play of the year. Braylon Edwards the latest example of why you should never tweet. FAU alumni received a strange text message this weekend. 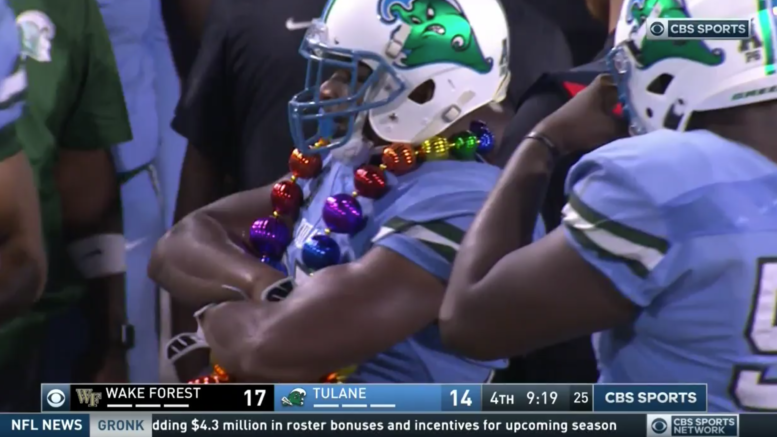 I love Tulane’s turnover Mardi Gras beads. Texas A&M vs. Clemson: Jimbo Fisher just can’t get away from Clemson. Aggies cannot make mistakes if they want to keep this one close. Oklahoma vs. UCLA: Sooners embarrassed Lane Kiffin. Can they do the same to Chip Kelly after Kelly lost his UCLA debut? South Carolina vs. Georgia: Look for the Gamecocks to give the defending SEC champs a battle. A win for South Carolina could change the whole complexion of the SEC East. Ohio State vs. Rutgers: Buckeyes could score 70 again, but they’ll probably be kinder to former OSU assistant Chris Ash. Pitt vs. Penn State: Nittany Lions need to use Appalachian State as a wakeup call, but Trace McSorley in primetime should be entertaining. Stanford vs. USC: Trojans going with 17-year old QB vs Stanford probably won’t end well. But can Bryce Love get on track? Boise State vs. UConn: A week after getting blown out at home by UCF, the UConn Huskies travel to the blue turf. Hang in there, UConn. Arizona State vs. Michigan State: Good early test for Herm Edwards and the Sun Devils. Spartans have to beware the curse of Pac-12 After Dark here.